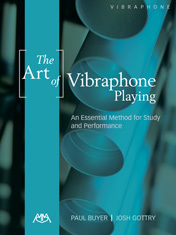 This text provides the fundamental techniques, musical concepts, and performance practices necessary to excel as a vibraphonist. Featuring two and four mallets in accessible to advanced exercises, studies, and solos and clear strategies for pedaling and dampening, this book will help those playing vibraphone music really understand how to play the vibraphone. The book is excellent, first class, and will become the go-to method book for young vibe players. Congratulations on a very well-written and presented tutor for the concert percussionist to approach understanding and playing vibes. …an exceptional new method book for the student vibraphonist that bridges the gap between existing materials for jazz vibes and classical instruction books for marimba and xylophone that will elevate the musical and technical skills of all aspiring vibraphonists. Percussion students will greatly benefit from the comprehensive content which brings together fundamental technical skills and pedagogically sound musical studies and short solo works, all through the lens of a non-jazz vibraphonist. I like the pieces, exercises, and concepts they are talking about, which is the real strength of the book. This book will help students to better understand, practice, and play the vibraphone through a comprehensive collection of well-written texts, exercises, and pieces.